If you are in Phoenix used cars for sale are easy to find but make sure you know what to look for. We can help you find the best used car. Buying a new car or used car is exciting. When buying a new used car, it is especially important to do an adequate amount of research on the make, model, and year of the car you are interested in so that your exciting new car doesn’t end up being a major disappointment. By checking these 4 important aspects of a used car you will more likely to drive off the lot with a dependable vehicle that will save you extra costs later down the road. You should never buy a used car without checking the mileage first. While the year of the used car you are looking at may be telling of its of its features, the car’s mileage will determine the car’s true age. Typically, a used car has approximately 12,000- 15,000 miles for every year since its been manufactured. Buying a 10 year old car with low miles may not always be a good thing, so look out for anything much higher or lower (i.e. below 5,000 or above 20,000 per year). Tires may not seem like an extremely important component of a used car but the tires are the only part of the vehicle that connects your car to the road. When you go to check the car out, ensure that the car is on level ground level so you can clearly check the tires for any possible sagging. Look for old tires showing signs of extreme wear like low tread depth as this makes the tires very risky on the road. If you decide to purchase the car with the old, worn tires, have a new set put on as soon as possible. Don’t be afraid to ask to look under the hood for signs of damage or rust and to check all the engine fluids. For instance, if the used car is an automatic use the transmission dipstick to check the transmission fluid (the fluid should be pink or red) because low levels can indicate leaks or neglect. Remember, replacing the transmission can be extremely expensive. – All the gears to ensure each gear has a smooth shift. – Check the brake fluid, and reservoir to make sure its is not leaking. – The belts should not have cracks or signs of drying because if they snap and you do not know how to replace them, it will cost between $100-500 depending on which belt goes bad. 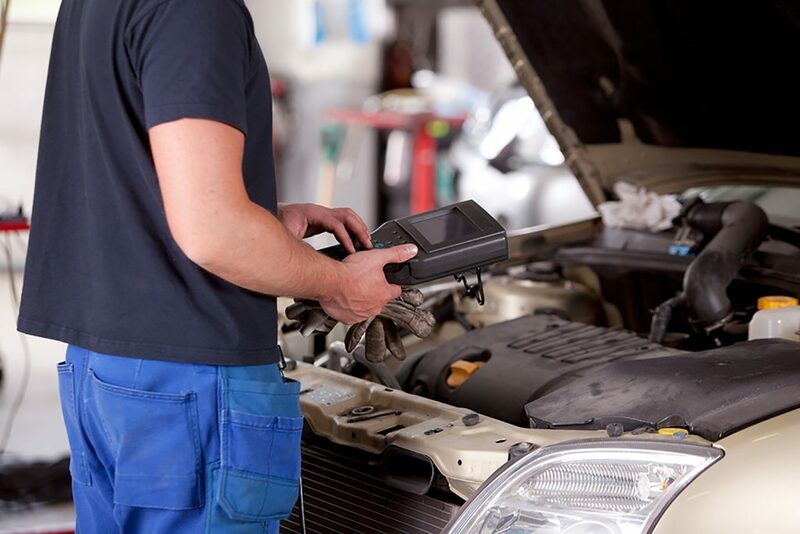 By inspecting these parts of the vehicle, you should be in good shape. Carefully inspect the body of the car for excessive damage. Look at the used car from end to end for rust spots, scratches, dents or waviness (on the sides). While minor scratches are quite common and not a big deal, be aware of holes or anything that looks like it may have been repaired. Similarly, high levels of rust can make the body and undercarriage the used car weak. If you want more information about the car you are interested in, simply order a CarFax or AutoCheck History Report because it will let you know if the vehicle has a reported accident. If you are in Phoenix used cars for sale are not hard to find at Auto Action. At Auto Action, we offer reasonable and fast auto loans, whether you have good credit, bad credit, or no credit history. Our goal is to make sure you have the car you want and the financing you need. Stop by one of our greater Phoenix locations or begin the process online. We would be happy to help you and your new driver find a safe and affordable car.